You know that feeling when you are truly smitten with someone? Or in the scrapbooking world, it might be something! Well the new Swoon collection from Little Yellow Bicycle lets you capture those connections. I am soo excited to share my first design team reveal with you. Or is it my 2nd, since I created a layout for the DT reveal? Anywho, I made these cards. They are a little departure from my usual layered, distressed look but I was really inspired to go for the more simple, elegant, almost delicate touch. 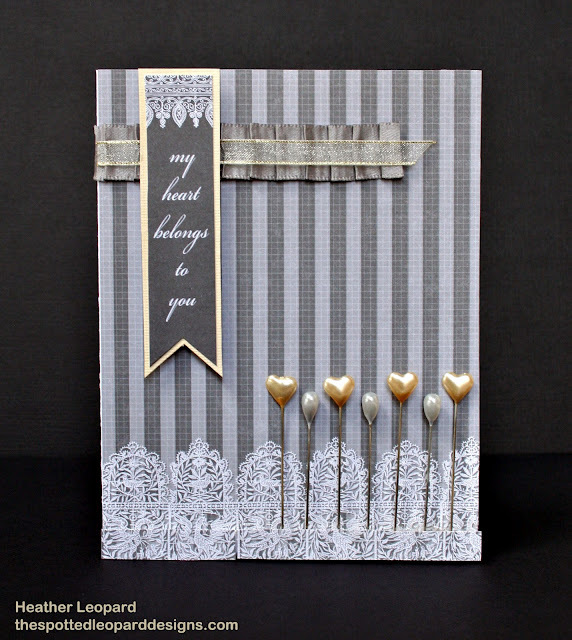 To create the card above, I cut strips approximately 3/4" wide by 4 1/4" long. I then punched them with a Martha Stewart punch. Starting at the bottom, I layered each on top of each other. There are 13 in all. I was going for a lacey effect and kept the rest of it simple by adding a bit of ribbon and a sentiment. I chose to keep this card simple as well. I think it could be used for a wedding or an anniversary. This card was inspired by the paper that, to me, looks like a garden trellis. The the stick pens, once laid on top of the paper, looked like flowers growing in the garden. 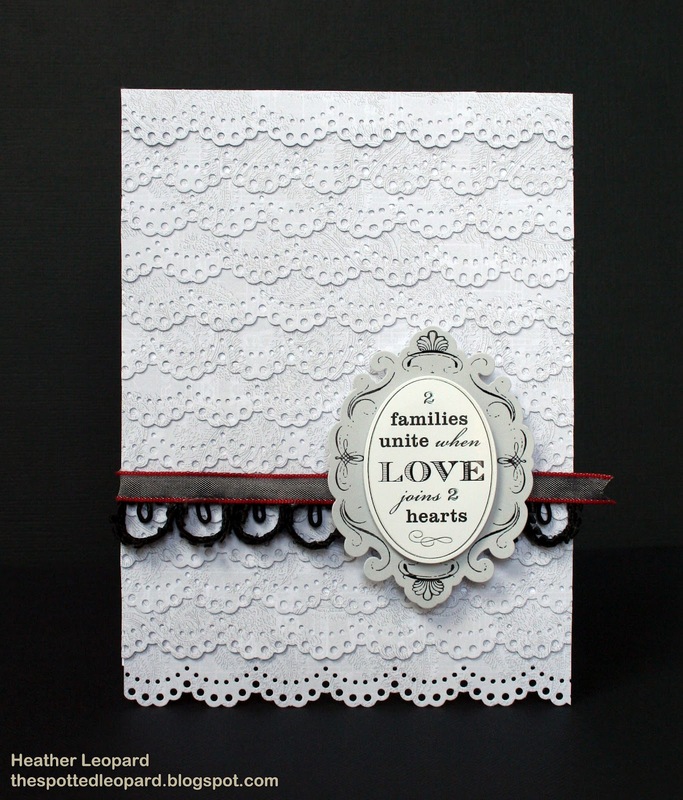 I pulled the card together by adding a bit of ribbon and a sentiment that has a similar trellis-like look. I added a frame, painted to match the color of the gold pins, around the sentiment to make it pop off the grey background. To attache the pins to the card, I cut the foam packaging they came in and glued to the card. I then cut a 2nd piece of the same background paper the length of the card so that the bottom trellis would match the back. I glued the paper to the foam packaging and then used pop dots on the opposite side of the card where there aren't any pins to adhere the paper. Thanks for stopping by today. Make sure to head over to the Little Yellow Bicycle blog to see the cards my fellow Biker Chicks Jen Chesnick and Shanna Vineyard created. These are gorgeous Heather!! Loving how you used the stick pins! wow Heather these are STUNNING! beautiful! i love the layered borders and the row of pins! These cards are so beautiful, elegant and pretty!